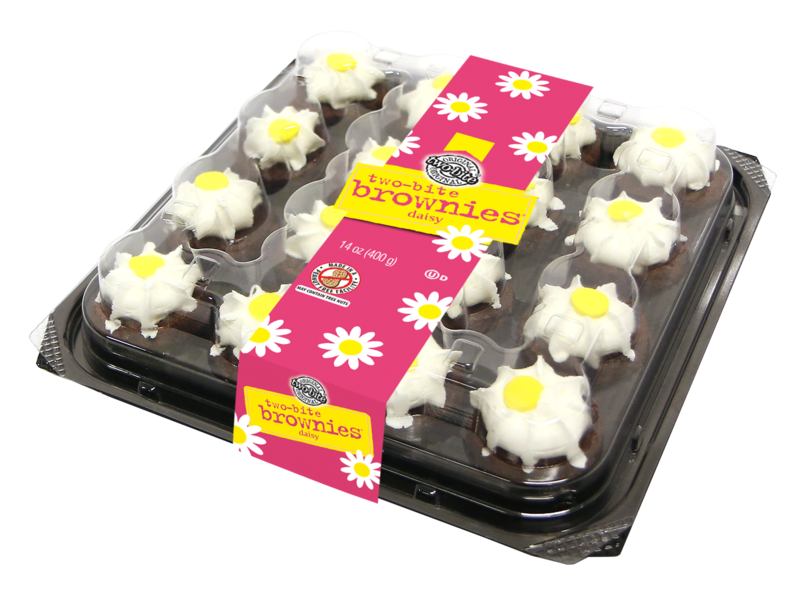 Bring in spring with this eye catching and delicious brownie platter. 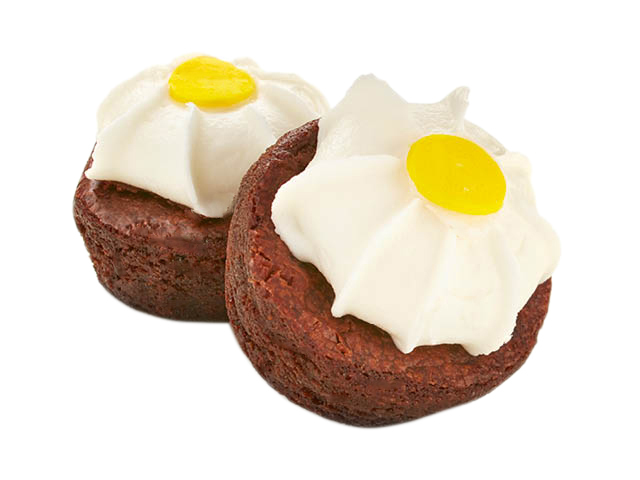 Rich, chocolaty brownies with fluffy vanilla daisy design on top. INGREDIENTS: SUGAR, BLEACHED ENRICHED WHEAT FLOUR (WHEAT FLOUR, NIACIN, REDUCED IRON, THIAMINE MONONITRATE, RIBOFLAVIN, FOLIC ACID), SOYBEAN OIL, ICING SUGAR (SUGAR, CORNSTARCH), VEGETABLE OIL SHORTENING (PALM OIL, CANOLA OIL, FRACTIONATED PALM OIL, FRACTIONATED PALM KERNEL OIL, MONOGLYCERIDES, POLYSORBATE 60), CORN SYRUP, WATER, EGG WHITES, CHOCOLATE (SUGAR, CHOCOLATE LIQUOR, COCOA BUTTER, SOYBEAN LECITHIN [EMULSIFIER], VANILLA EXTRACT), COCOA POWDER (PROCESSED WITH ALKALI), INVERT SUGAR, MARGARINE (SOYBEAN OIL, FRACTIONATED PALM OIL, WATER, SALT, WHEY [MILK], SOYBEAN LECITHIN, MONOGLYCERIDES, NATURAL FLAVOR, ANNATTO EXTRACT [COLOR]), VITAMIN A PALMITATE, VITAMIN D3), TOPPING (ICING SUGAR [SUGAR, CORNSTARCH], MODIFIED CORNSTARCH, CORNSTARCH, FRACTIONATED PALM KERNEL OIL, CELLULOSE GUM, SOYBEAN LECITHIN, ARTIFICIAL FLAVOR, POLYSORBATE 60, COLOR [FD&C YELLOW #5], SHELLAC), NATURAL AND ARTIFICIAL FLAVOR, MODIFIED CORNSTARCH, SALT, WHEY (MILK), NONFAT DRY MILK, MONO- AND DIGLYCERIDES, LEAVENING BLEND (SODIUM ACID PYROPHOSPHATE, SODIUM BICARBONATE, CORNSTARCH, MONOCALCIUM PHOSPHATE, CALCIUM SULFATE), SOYBEAN LECITHIN, MOLASSES. 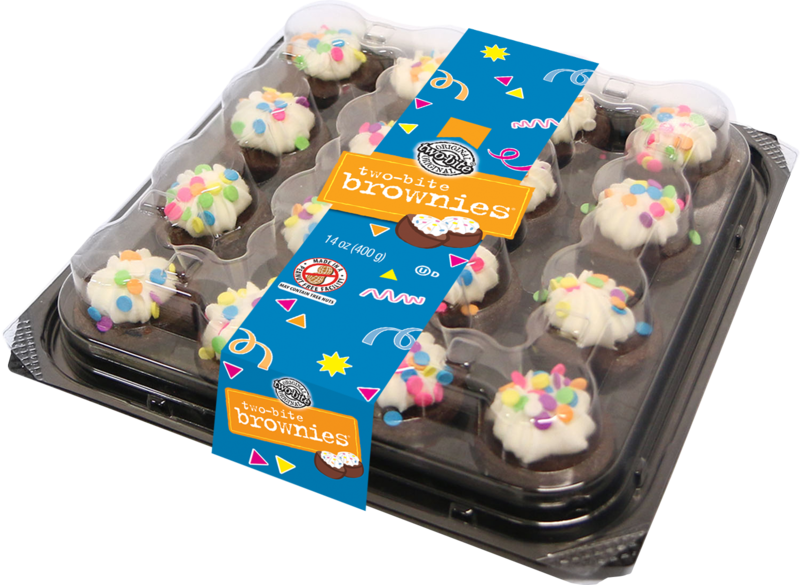 Celebrate spring with our rich and chocolaty brownies, topped with fluffy vanilla icing and fun sprinkles. 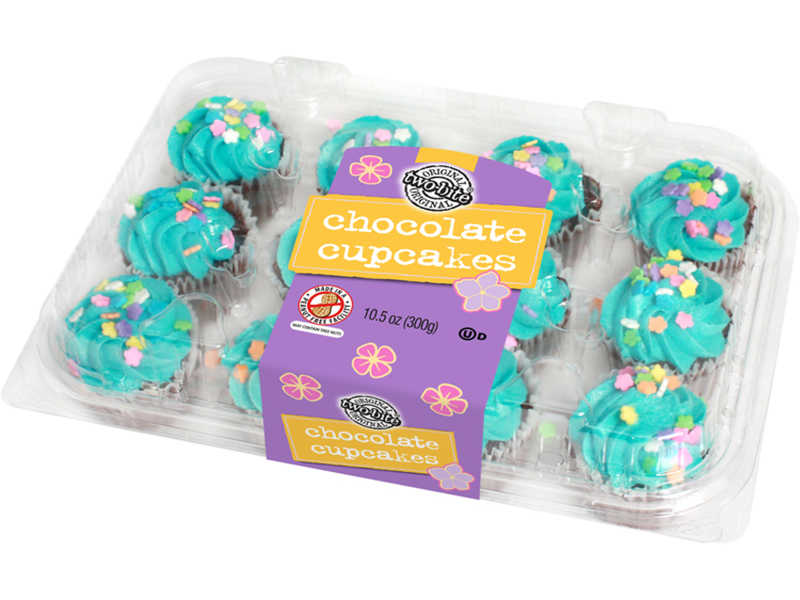 Rich decadent chocolate cake topped with sweet blue vanilla frosting and sprinkles with a colorful assortment of pastel colored flowers. INGREDIENTS: ICING SUGAR, SUGAR, SHORTENING (CANOLA, PALM, MODIFIED PALM AND PALM KERNEL OIL), WATER, ENRICHED WHEAT FLOUR (WHEAT FLOUR, NIACIN, REDUCED IRON, THIAMINE MONONITRATE, RIBOFLAVIN, FOLIC ACID), EGG, SOYBEAN AND CANOLA OIL, GLUCOSE, COCOA POWDER (PROCESSED WITH ALKALI), SKIM MILK POWDER, MODIFIED CORN STARCH, WHEY POWDER, LEAVENING (SODIUM ACID PYROPHOSPHATE, SODIUM BICARBONATE, CORN STARCH, MONOCALCIUM PHOSPHATE, CALCIUM SULFATE), SOYBEAN LECITHIN, WHEAT GLUTEN, BUTTER (CREAM, SALT), SALT, ARTIFICIAL FLAVOR, DIACETYL TARTARIC ACID ESTERS OF MONO AND DIGLYCERIDES, COLOR (FD&C YELLOW #6, FD&C YELLOW #5, FD&C BLUE #1, RED #3, FD&C RED #40), CORN STARCH, HYDROGENATED PALM KERNEL OIL, GUM ARABIC, POLYSORBATE 60. CONTAINS WHEAT EGG, MILK AND SOYBEAN. 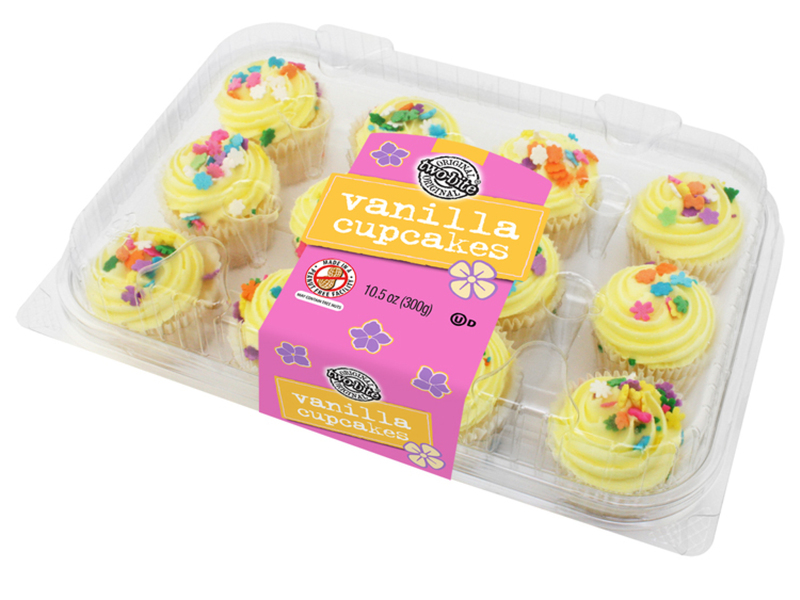 Delicious moist vanilla cake topped with a sweet spring yellow vanilla frosting and finished with pastel blue, green, yellow, purple, and pink flower sprinkles. INGREDIENTS: CAKE: SUGAR, BLEACHED ENRICHED WHEAT FLOUR (WHEAT FLOUR, NIACIN, REDUCED IRON, THIAMINE MONONITRATE, RIBOFLAVIN, FOLIC ACID), EGG, VEGETABLE OIL (CANOLA AND SOYBEAN), WATER, MODIFIED CORNSTARCH, WHEY (MILK INGREDIENT), LEAVENING (SODIUM ACID PYROPHOSPHATE, SODIUM BICARBONATE, CORN STARCH, MONOCALCIUM PHOSPHATE, CALCIUM SULFATE), SOYBEAN LECITHIN, WHEAT GLUTEN, SALT, DIACETYL TARTARIC ACID ESTERS OF MONO AND DIGLYCERIDES, ARTIFICIAL FLAVOR. 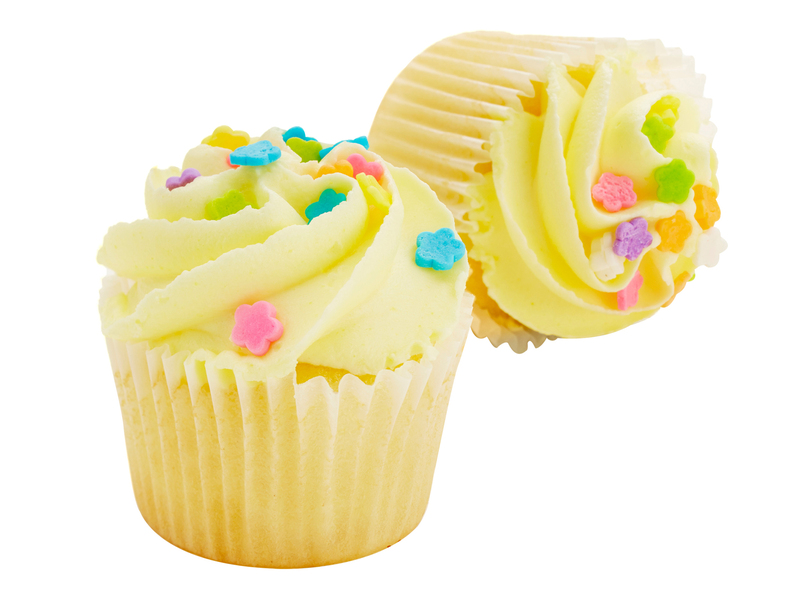 ICING: ICING SUGAR, NON-HYDROGENATED VEGETABLE OIL SHORTENING (CANOLA, PALM, MODIFIED PALM AND PALM KERNEL OILS), GLUCOSE, WATER, SKIM MILK POWDER, COLOR (FD&C YELLOW #5), BUTTER (CREAM, SALT), ARTIFICIAL FLAVOR, SALT, POLYSORBATE 60. 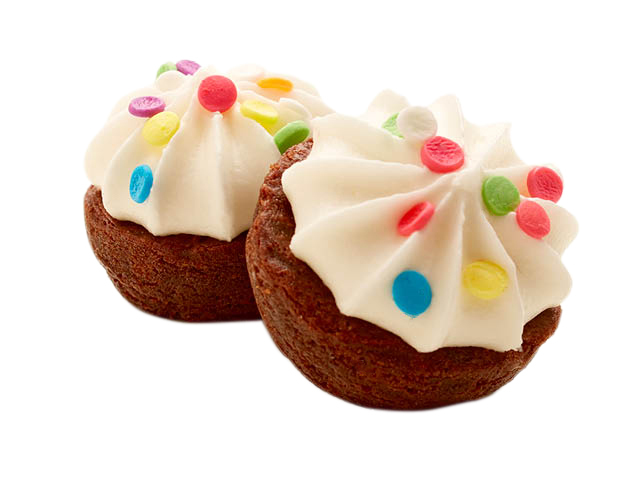 SPRINKLES: SUGAR, RICE FLOUR, MODIFIED CORN STARCH, CORN STARCH, PALM KERNEL AND/OR HYDROGENATED COTTONSEED AND/OR SOYBEAN OILS, CONTAINS 2% OR LESS OF: SOYBEAN LECITHIN, COLOR (FD&C YELLOW #6, FD&C YELLOW #5, FD&C BLUE #1, FD&C RED #3, FD&C RED #40), ARTIFICIAL FLAVOR, CELLULOSE GUM, CARRAGEENAN, POLYSORBATE 60.